Fri. Apr. 27, 2012 ….If you are a fly angler and flyfish for trout in the Appalachians you are going to deal with this in spring and early summer. Had a great trip with regular client Jeff Chalmers as we dodged thunderstorms all day and muddy water and still managed a 30-35 fish day with a 23.5″ rainbow and a 20.5″ brook trout. But the water wasn’t high then….eventually later in the day it became so. Slightly high isn’t a problem and discolored isn’t either a game breaker, but high to flood stage flows? That is the worst and chances are a blow out will sideline your trip no matter what your skill level. This past front and its rains certainly makes for some of this. I cancelled both a private water trip today to SW Va with client Mike Workman of Thomasville, NC. 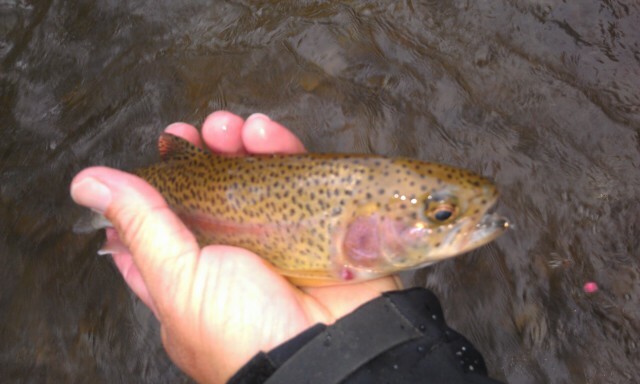 We had planned to fish the Little River…..the land of giant rainbows of 10lbs or more. But they got the same line of storms yesterday as we did in the NC Mtns…in fact it was the tail end of the long line of supercells that produced some rains in excess of 4″ in SW Va. Just how does that add up or what does it look like? Well, consider this… Late last night the North Fork, which normally runs about 250cfs-300cfs this time of yr and was yesterday, took the brunt of the hit of the storms and it rose from 250 to 6900cfs. How much water is that? Well, the South Holston tailwater is a big, wide river and they commonly run 2500-2700 down this one at full generation. Imagine 6900 in a river half the size of the SoHo. That is what it was like on the NF Holston and nearby towns of Lebanon, VA and Claypool Hill. But things are coming down fairly quickly, as the NoHo is at 2270 and dropping. NC WATERS: Davidson River 136 (128), South Fork New 771(340), Linville 151(120), South Toe 227(110), French Broad 3590(2100), Nantahala River 270(205), Mills River 183(180), Mitchell River 152(110), Mayo R. NC 313 (300)….VA WATERS: Escatawba /Dunlap Creek 1270(180), Smith River Martinsville 807(380), Jackson River 1190(300), South Fork Holston Chilhowie, VA 500(120), South Holston Damascus, VA 2020 (510), Middle Fork Holston 509(110),North Fork Holston 2270(300), Chestnut Creek (Farmers Creek) 97(68), South Mayo 118(115), New River Galax, VA 4120 (2000). TN TAILWATERS: South Holston operating one unit 9am-10am(1359cfs) and one unit from 5-6pm(1359cfs); Watauga River/Wilbur Dam one unit from 9am – 9pm. Make no mistake, if you like wild trout fishing and don’t mind a hike then there’s a lot more chance of finding some fishing. Why? Everything flows downhill and those places clear and drop first. Plus, wild streams are looking great and fishing well right now. Make sure you have split shot and get nymphs down in higher flows. 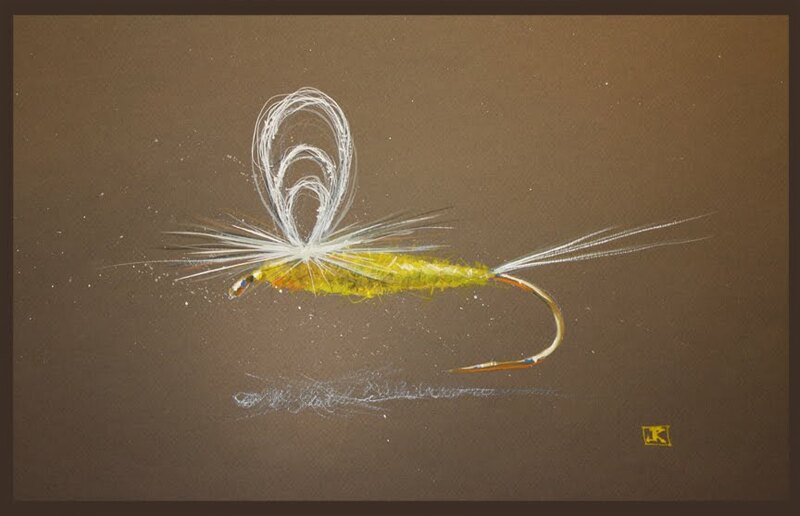 If conditions are good enough to fish dry then make sure you have plenty of Elk Wing Caddis and some yellow bodied or orange bodied Mayfly patterns…as sulphurs in size 14-18 and light cahills are coming off on these waters daily. Here’s a clip of yesterday’s fishing with client Jeff Chalmers. Have taken Jeff fishing many times and he seems to have the ‘mojo’ for large fish. He has a way of connecting to them…..I just take him to a spot, point out the cast and presentation. Done. The fish will be in the net shortly. To say Jeff has a knack for it is putting it lightly. I remember one such time years ago when I took Jeff out during a high water day in spring. He landed one of the most beautiful rainbows that was 26-27″ long and very near 7-8lbs. 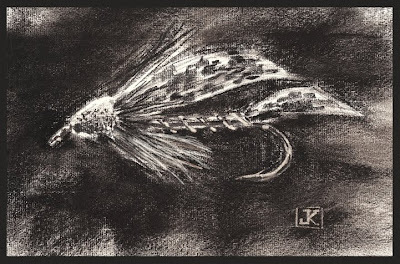 And he did it on a small fly and 5x in heavy current… which is nothing to snuff at. Also, for those who frequent the TN Tailwaters the TVA now has a pretty cool app you can download for your smartphone. You can get Lake Info, lake levels, generation schedules, precip patterns, and more. There are two versions, one is for Android phones and the other for the iPhone. You can click the appropriate link below for your device and it will take you right to the download page. Sometimes having to do a little exploration, check out some new water, use the time to find new spots…all of this can be great when your ‘home water’ or ‘favorite water’ is blown out. You never know when you might find a gem or two. And many of them are where you drove by or would never guess. Have a great weekend and I will be out tomorrow again scouting conditions and will have another fishing report then. Have a nice evening…! You can Join Our Fly Fishing e-News Mailing List by texting JWFLYFISHING to 22828 to get started…..
Unbelievably Stormy Day, Lucky To Catch Fish…. Thurs. Apr.26, 2012…..We had an incredibly stormy day and spent several hours waiting it out and moving from downpour to downpour. This morning was downright ugly…..heavy rain, frequent lightning, thunder. I was just before calling it early and us heading home. 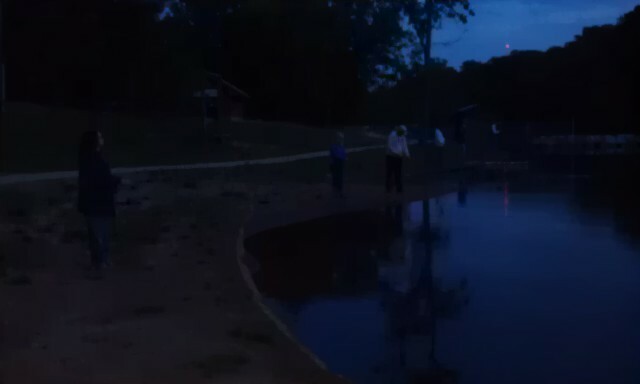 The water rose, got dirty, but we were catching fish. Guided Jeff Chalmers today and had a good day considering the weather. Fished three different waters and moved from spot to spot getting out of storms in each place. Several waters are muddy, the final place we fished put an end to the day when the thunderstorms finally muddied the last water. We landed over 30 in about as tough a conditions as you could ask for. 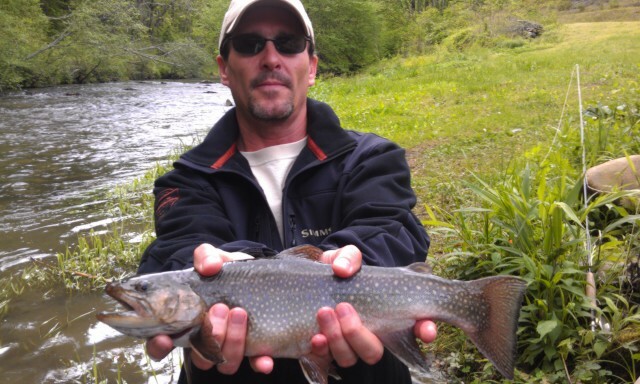 Jeff caught one 23.5" rainbow and a 20.5" brook trout on some remote water I knew of that rarely gets fished by fly anglers. We also landed 3 BRBs …..blue ridge bonefish that is…lol. These 3 were hognose suckers and one was over 20" and gave a couple blistering runs. They are like a copper bonefish with a tubular downturned mouth. And they will eat a small nymph just like a trout will. Headed home, its late and it looks like tomorrows trip to SW VA with guiding Mike Workman on private water is a no go. The North Holston is nearby and it was flowing at a normal 265cfs. After todays heavy storms it is flowing right now at a mind boggling 6900 cfs. Escatawba is at 3970 if you can believe it. Will have another report tomorrow, have a great evening! Great Evening, A Fine Class…. Wed. Apr. 25, 2012….Had our Flyfishing 101 class tonight and what a fantastic group of folks. We did casting, presentation and line management, and knot tying and rigging. Getting in late, rounding up stuff for 3 days of trips weather permitting. Looks like some severe thunderstorms are a threat for the next two days. I will be guiding regular client Jeff Chalmers tomorrow and Mike Workman Friday, with the Flyfishing 101 class field trip on Saturday. Tues. Apr. 24, 2012…Guided Powell Petty and Jeff Pope from Hillsborough, NC, today and it was windy and cold. It started as a stiff breeze and in the high 30s and soon low 40s. And it felt a little more like December than it did April. We fished two different waters, one was high and one was low. Both waters had significantly lower water temps than a week ago. We fished the first place and water temp had been around 60F a week ago and this morning it was 46.4F when we started. We spent our time nymphing and did well with Punkin’ Head PTs tied on a #18 scud hook. Also, any other small sulphur Luke nymph imitation. Lots of #18 dorotheas have been hatching and some did today. We landed about 40 fish or so and one large BRB where we spent the first half of the day, which stands for blue ridge bonefish. In other words a large hognose sucker. We left after lunch and hit another water. It got even more windy there and it was tough. We landed maybe 10 more fish and called it a day. It was getting chilly so we headed home. Home a little late, headed out for a short turkey hunt in the morning on our property here uv Summerfield. Located a huge tom and he is responding regularly and will see if he will come in tomorrow. Tomorrow night is our next to last class of our Fly 101 class and we will be preparing for our 4/28 field trip. What a great group of folks I have, should be great fun. Have a great evening and a fantastic Wednesday. You can Join Ou,,,,,,,,zccdcfrexddd xdxddsxxr Fly Fishing e-News Mailing List by texting JWFLYFISHING to 22828 to get started…..
Tues. Apr. 24, 2012… It’s not chilly this morning, its cold. Headed out to guide Jeff Pope and Lowell Petty, both from Hillsborough, NC. Expecting a great day today. Mon. Apr.24, 2012…A slow day, the quick weather change really put the turkeys down as they weren’t moving much at all and they weren’t making any noise either. We found many scratches when two large groups of hens had just been. 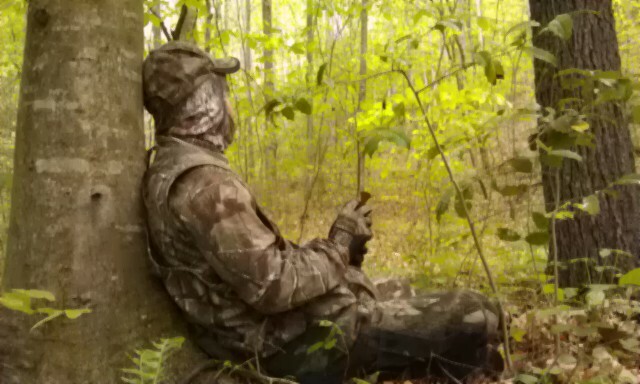 Had one gobbler respond twice to a crow call then we did not hear another peep out of him. Will wait a day or so and it should be red hot again. Another trout n turkey day on Wednesday. Today was still a great day. Any day you can spend with your kids outside is great whether you score one or not. Making memories is what it is about. Waters everywhere are clearing nicely and my guess is one heck of a sulphur hatch coming with these cooler temps, especially in the evening. I will be guiding Jeff Pope and Lowell Petty from Hillsborough, NC, tomorrow and we ought to find out how good it is. Have a great evening and more to come tomorrow from the river. Mon. Apr.23, 2012…..Slow morning and we are sitting on a Forest Service Rd, my sons and I have checked 3 spots, done some calling….think we saw some birds but they would not respond. We hiked in to the very remote Buffalo Fork headwaters, there were a lot of ground scratches and they were fresh—perhaps only a day old. We are headed to lunch before hitting the Buffalo Cove this afternoon before the birds go back to roost. The whole hike in we were on one of the most remote sections of the Buffalo and it is a fine trout stream. 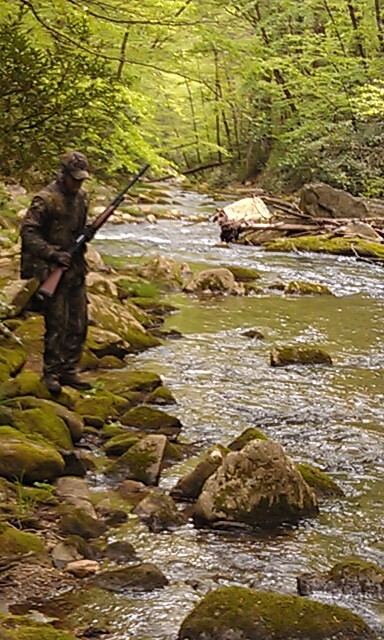 Will be doing some summer hike in wild trout trips for anyone interested. FYI—most places are clearing up nicely….wish we had a rod here. Mon. Apr. 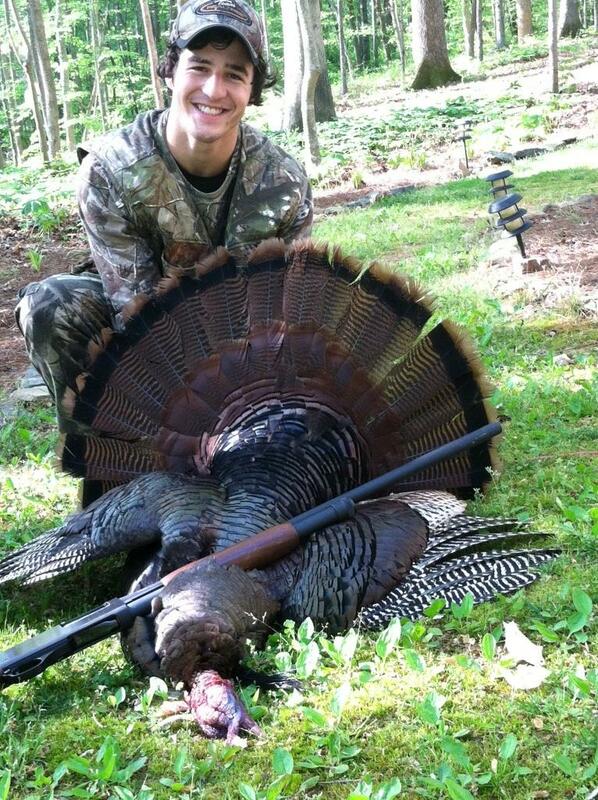 23, 2012….We have had a few trout, now time for some turkeys. Just getting ready to make the 1/4 mile trek into the woods in the dark as my sons and I are getting ready to hopefully call in another spring gobbler. Hopefully the weather won’t be too raw. Fishing is outstanding right now where you can find clear water. Did well yesterday afternoon landing about 20 fish. One heck of a ephemerella dorothea, aka "sulphur" hatch poured off during high water last evening. For a while I asked…. "is that a sulphur or a flake of snow? Some pretty unsettled spring Carolina weather. Rain, Snow, and Cold Weather…. Sun. Apr. 22, 2012…..Just a heads up….wow how things have changed. Headed up this afternoon to the mountains in Buffalo Cove in Caldwell County and my sons and I are turkey scouting and hunting tomorrow. It is cold and rain is changing to snow and the wind….well its brutal. Not the best conditions. Temps are supposed to be in the low to mid 30s, with a frozen mix. Just the conditions we were hoping for….? Not hardly. And waters are pretty high and muddy or murky everywhere and we spent the afternoon evening fishing in Buffalo Cove area. It was very wet and we did see three toms, and hopefully we will get some opportunities tomorrow. Fishing was good despite the incredibly high flows. We caught about 20 fish—-a mix of rainbows and brookies. 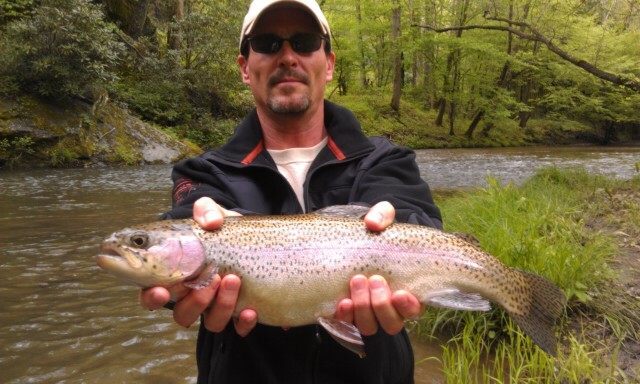 Both Buffalo and Joes Fork were both very high, but rainbows like that and for them its game on as usual. Saw a ton of sulphurs hatching, it was like a blizzard hatch of them. Too bad the water was too high to see any fish rising to them. Of course, I am sure with the cool weather the bugs will be coming off for a fee more days. It’s going to be great when the stream levels improve in a day or so.